An 18-year-old Arcanum woman was cited for failing to control her vehicle and driving with a temporary instruction permit without a licensed operator who is at least 21 years of age after she crashed her vehicle into Cope’s Distributing on Wednesday in Greenville. 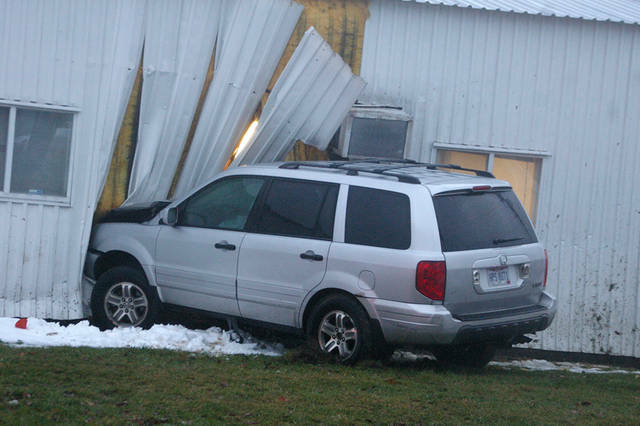 GREENVILLE – An 18-year-old Arcanum woman who was driving with a learner’s permit was cited after she crashed her vehicle into Cope’s Distributing on Wednesday in Greenville. According to a report from the Greenville Police Department, Carolyn Bonner was cited for failing to control her vehicle and driving with a temporary instruction permit without a licensed operator who is at least 21 years of age. Bonner reportedly was driving a 2003 Honda Pilot westbound on Sater Street when she failed to stop at a stop sign. Her vehicle struck a 1997 Chevy S10 driven by Robbin Cole of Greenville, who was attempting to turn left onto Markwith Avenue. After striking the Chevy S10, Bonner continued to accelerate and crashed her vehicle into Cope’s Distributing, knocking a hole into the building. Bonner and her passenger, Kasey Purvis, 19, of Greenville, both were transported to Wayne HealthCare by Greenville Township EMS for possible injuries. Robbin Cole and her passenger, Gary Cole, were uninjured in the crash. Bonner’s vehicle suffered significant damage in the crash and was towed from the scene while Cole’s vehicle suffered minor damage. The Cope’s Distributing building also suffered significant damage. This entry was tagged Arcanum, Cope’s Distributing, Cope’s Distributing Inc., crash, Greenville, Greenville Police Department. Bookmark the permalink.